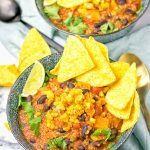 This hearty and protein rich Mexican Quinoa Tortilla Soup is entirely vegan, gluten free and so incredibly easy to make. A perfect go to recipe that you can give your own touch with many optional add ons. After I have had some fun with sweet temptations like my Cheesecake Brownies with Caramel Apples or the Whoopie Pie Ginger Cookies, I’m back on team savory. And you can believe me, you will be too. I hope you come on board for a big bowl of this Mexican Quinoa Tortilla Soup. 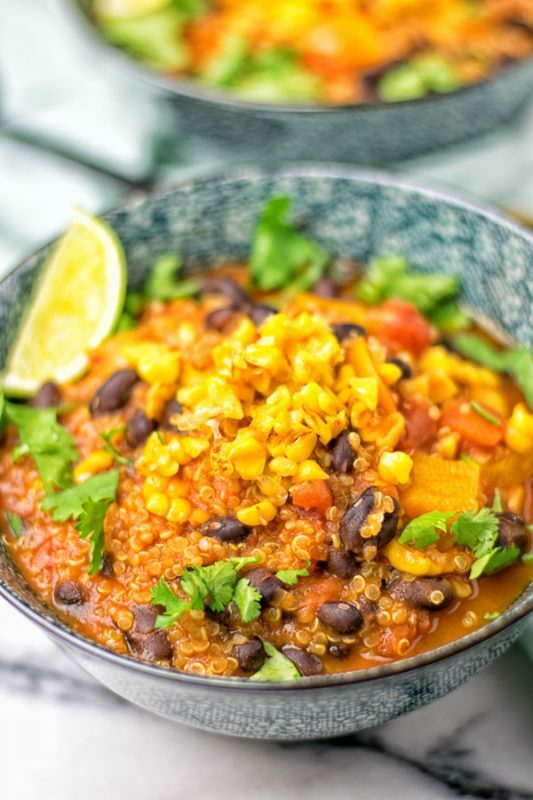 It is full of flavor, hearty, healthy, protein packed say welcome to quinoa and black beans, made in one pot, super easy, worthy to get in a to go routine, shareable, great for potlucks. Oh yes, you can bring this to every event where food is required. It’s so good for any weekly meal plan. 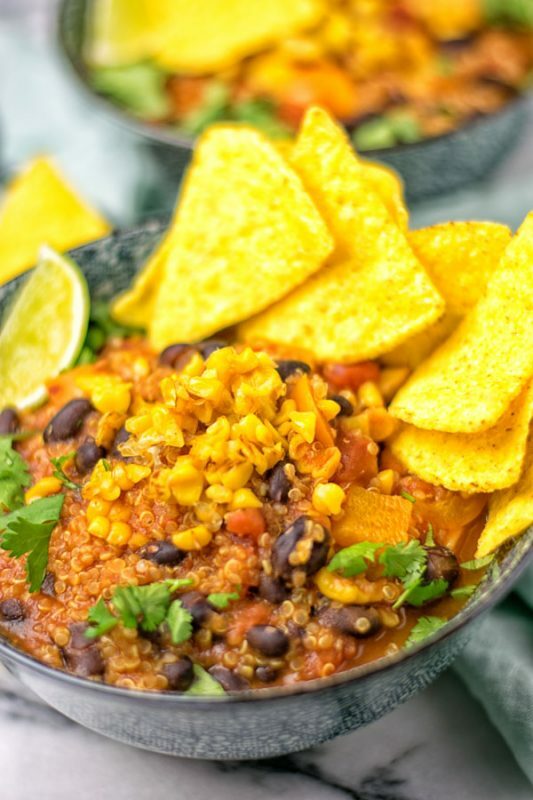 How to make a Mexican Quinoa Tortilla Soup? 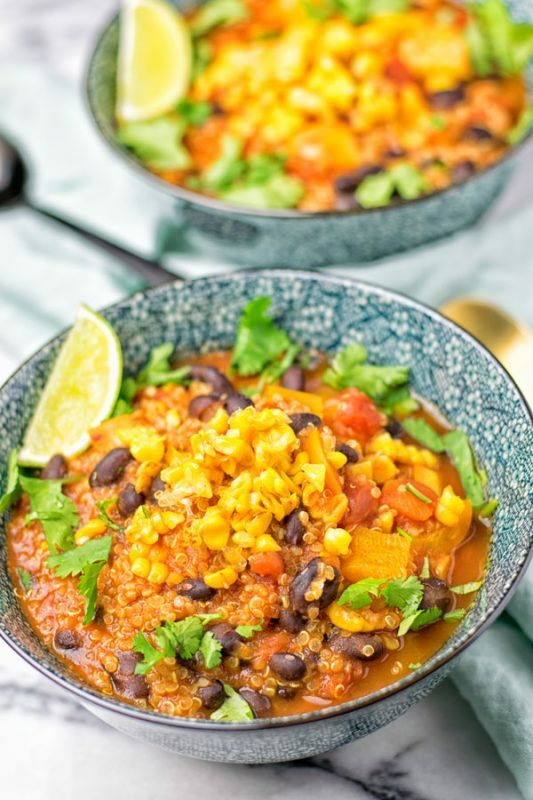 You won’t believe me how easy to make this Mexican Quinoa Tortilla Soup is. Simply put all the ingredients except the black beans and tortilla chips into a casserole and cook for 15 minutes. Season with salt and pepper. After 10 minutes add the drained black beans, divide into bowls or plates. Serve with tortilla chips. That’s all! Super easy, time saving, a delicious dairy free lunch, dinner or even snack. Note, if you add the other optional ingredients, like corn, bell pepper, cumin, and at the end time juice for an extra flavor kick, you can go straight ahead and add these right at the beginning with the other ingredients, like quinoa, vegetable broth and garlic. 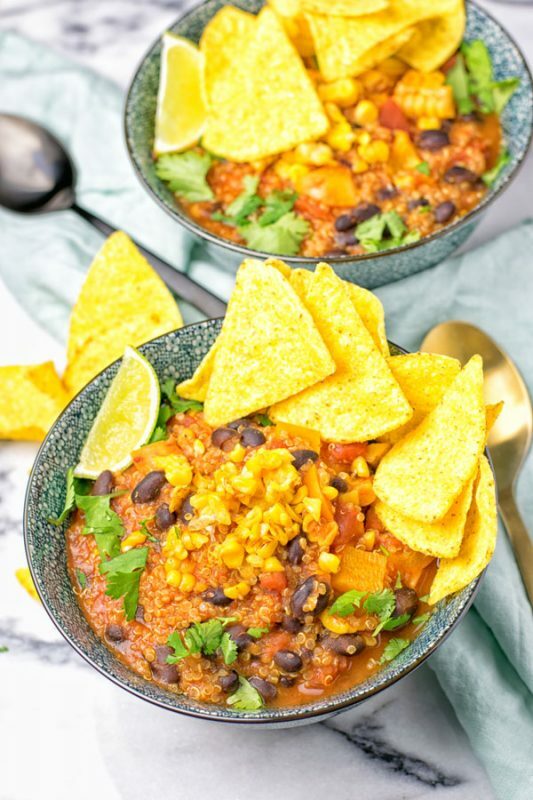 This Mexican Quinoa Tortilla Soup is an easy and delicious resource for plant based protein. Black beans are rich in protein. With one cup cooked ones you get 15g of protein. Quinoa is also naturally high in protein. 1 cooked cup supplies you with 8 grams of protein. Both quinoa and black beans therefore make it a tasty an easy way to get more protein for everyone. Seriously this is the dish for everyone. Even meat-lovers won’t miss the meat. It must be the texture of quinoa. I made this recently alone 4 times with friends and everyone agreed it’s so satisfying and done in no time. Even the pickiest meat advocates got a soft spot on it in no time, yes that must mean something. I can happily say it’s my new to go. Plus it’s so pretty easy to make with ingredients you can have in your pantry. The entire dish is made from just 6 ingredients and in 2 easy steps. Plus you can customize by adding optional add ons to it, to make your signature. I find it’s really delicious on it’s own, but you can serve it with fresh homemade bread, it is so delicious. Try my Hummus Homemade Bread or the Garlic Butter Avocado Bread for yourself. Nothing will beat homemade bread. When you make these you will inhale the delicious aroma of the smell in your kitchen while the bread is baking in the oven. If you give this a try, share a big bowl with me on Instagram or Facebook. I can’t wait to see your remakes. Simply put all the ingredients except the black beans and tortilla chips into a casserole and cook for 15 minutes. Season with salt and pepper. 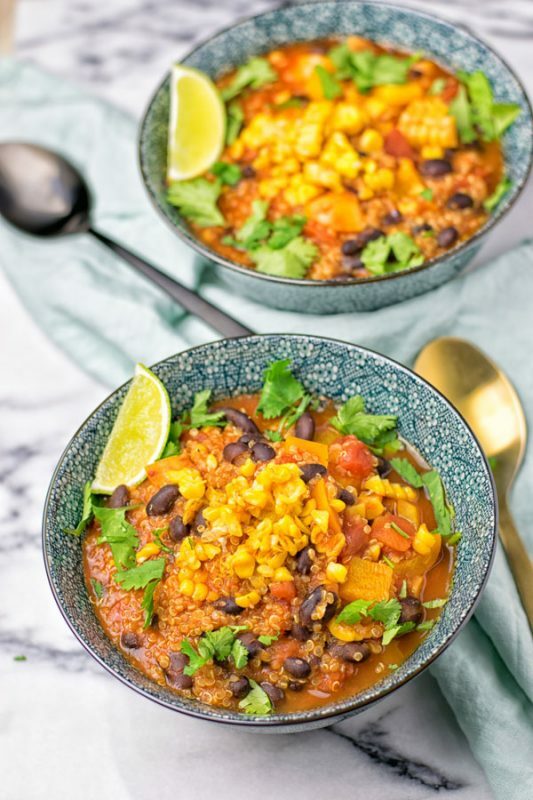 If you add the other optional ingredients, like corn, bell pepper, cumin, and at the end time juice for an extra flavor kick, you can go straight ahead and add these right at the beginning with the other ingredients, like quinoa, vegetable broth and garlic. Do you cook this in the oven or stovetop? And what temperature? Hi Carrie! Use medium heat! No cooking instructions. What’s the oven temp?? Hi Erin! Please check and read the cooking instructions precisely! Cooking instructions have been read and reread. It does not say whether to use the stove top or the oven. Medium heat in a comment is the only indication of how to cook. This looks like it could be a good recipe, but I don the know how to cook it. Hi Hannah! Use stove top with medium heat! What temp if you use the oven? Hi Lynne! I used the stovetop all the time to make this soup. I’ve never tried to make it in the oven, so I don’t have any advice. But if you give this a try, let me know.